From the yard of the Ptarmigan Ridge Intermediate School in Orting, Wash., on a beautiful brisk November morning, snowy Mount Rainier looms silently in the distance. Only a thin halo of clouds encircles the top. At 14,410 feet, Mount Rainier in Washington state overlooks growing suburban areas in the Puyallup Valley. More than 150,000 people live atop deposits from past large mudflows called lahars that swept off the volcano into the valleys. Photo by Dave Wieprecht, USGS. The scene is a familiar one to Rex Kerbs, who has lived in the shadow of the mountain his entire life. Growing up in Auburn, Wash., he visited Mount Rainier throughout his childhood to hike, camp and ski. And while studying and working as a geologist, he became keenly aware of the volcanos tumultuous role in shaping the region. But as principal at Ptarmigan, Kerbs now looks at the mountain in a different way  with a heavy responsibility for the lives of the schools 450 students and 50 faculty members. Although the Cascades volcano has not erupted since 1894, Mount Rainier is active and will erupt again. But what skews Kerbs view of the mountain are large mudflows called lahars, which can occur without warning  even in the absence of a significant eruptive event. Orting residents face a one in seven chance that a lahar (the Indonesian word for a mudflow) will occur in their lifetimes. The school sits in the Puyallup River valley, which drains the west flank of Mount Rainier and has a view of the Ptarmigan Ridge, an ancient lava flow on the volcanos northwest slopes. Moving at speeds up to 80 kilometers per hour, a lahar would race like a wall of wet, turbulent concrete into the valley. During such an event, students and other valley residents would have only 45 minutes to seek higher ground before being inundated with a fast-moving slurry of mud, rock and water as thick as 10 meters (about 30 feet) deep. Classified by the U.S. Geological Survey (USGS) as the greatest hazard at Mount Rainier, the lahar risk has been gradually gaining the attention of locals over the past two decades. Due to the diligence of a core group of educators and geoscientists such as Kerbs, the community not only is better prepared, but also has a heightened appreciation and awareness of their geologic landscape. 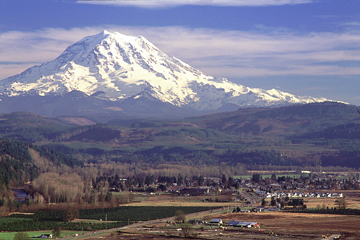 The city of Orting, population 4,400, is located at the confluence of the Carbon and Puyallup rivers in the Puget Sound Lowlands. The valley floor represents layers of deposits from old lahars. At least 60 lahars have flowed off Mount Rainier into its draining river valleys in the past 10,000 years, with the largest events occurring about every 500 years. 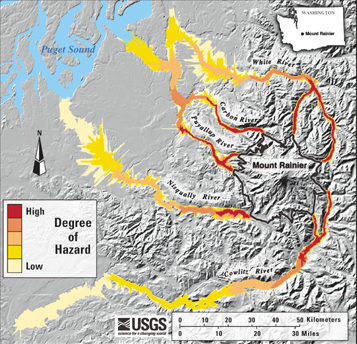 This map shows the lahar-inundation hazard for the major stream valleys in the Mount Rainier region, Washington. At the confluence of the Puyallup and Carbon rivers, the city of Orting is in a higher risk area for lahars. Image courtesy of USGS, from Iverson et al., 1998, Geological Society of America Bulletin, v. 110, 972-974. In the largest known event, which occurred about 5,600 years ago, the Osceola Mudflow buried more than 540 square kilometers in a layer of debris about 8 meters (25 feet) deep. It carried as much as 4 cubic kilometers of volcanic debris 100 kilometers from the mountain. Rock debris continued flowing into the Puyallup and Kent-Auburn valleys in the following centuries  raising the level of the valley floors. The most recent lahar occurred about 500 years ago. Called the Electron Mudflow, it swept through the Puyallup Valley, taking down trees as large as 3 meters in diameter and burying them under layers of muddy debris. Orting now rests on top of these layers. Only over the past two decades, however, have geologists nailed down the present-day risk. Evidence for the lahars has revealed itself in a very slow way, and its become obvious that Mount Rainiers history is very complicated and much more detailed than we thought, says Pat Pringle, a geologist at the Washington Department of Natural Resources. Also called Stumps Pringle  because he has extensively dated tree stumps buried by large historic lahars  he points out that buried trees have become one of the keys to unlocking the secrets of Mount Rainiers past. The evolution of thought for the Mount Rainier lahar hazard, however, began with Rocky Crandell in the 1970s, when he first documented old lahar deposits. His work showed that the volcano has delivered debris to downstream portions of the Puget Sound Lowlands valleys for thousands of years. But it was Mount St. Helens 1980 eruption that catalyzed research for understanding volcanic risks. Pringle, who was public information officer at the USGS Cascades Volcano Observatory (CVO) during Mount St. Helens latest eruption in 1986, says that Mount St. Helens illustrated volcanic risk in a whole new way, pulling the issues into the forefront for both the public and researchers. So suddenly people started looking at other volcanoes to paint the same picture there, Pringle says. After that historic eruption, USGS set a goal of performing geologic mapping and studies at all the Cascades volcanoes in order to create revised hazards maps. In 1995, they released the first set of hazards maps for Mount Rainier. Using data from the lahar-buried tree stumps, boreholes, ash deposits and lahar deposits, they forecasted that future lahars will follow the river valleys that drain Mount Rainier; four of the five major river systems flow westward into the suburban areas of Pierce County, including Orting. Mount Rainier has built up a huge edifice over time. It has grown so high, in fact, that the mountain now supports the largest system of glaciers in the lower 48 states. Starting at more than 14,000 feet elevation, the mud slurries would gain tremendous energy as they reach the valleys. And the glaciers feed the cycle that has triggered many of the large prehistoric lahars: surges of meltwater cascading from the rapid heating of snow and ice during eruptions. Not all lahars are caused by large eruptions, however. Lahars can be triggered by structural weakness due to various phenomena, including small eruptions (which may leave behind little evidence), melting snow and possibly earthquakes. So Mount Rainiers hazards include not only the lahars from the hot rocks interacting with snow and ice like at Mount St. Helens, but also those from parts of the mountain collapsing because theyre mechanically weak, Pringle explains. The most vulnerable section of the mountain is its western flank, leaving the Puyallup Valley most at risk from failure of weakened rock. The Electron Mudflow is a recent example of such a structural collapse of the mountains west flank. An analysis of ash and lahar layers by Pringle, Kevin Scott and Jim Vallance at USGS shows no evidence of an eruption event accompanying the Electron event. Their work verified Crandells work 30 years earlier and hit home the idea that lahars could occur at Mount Rainier without advance warning. Its a powerful combination of factors, Pringle says. The various lines of support for the lahar risk at Mount Rainier all seemed to converge in the 1990s, as population steadily increased in the Puget Sound Lowlands communities. Many of the people moving to town did not know that Mount Rainier was a volcano, says Carolyn Driedger, a hydrologist with CVO in Vancouver, Wash., let alone about the risks it posed. Driedger, who has spearheaded outreach activities for Mount Rainier, says that the hazards visibility increased as new development projects unearthed more lahar-buried tree stumps and more data surfaced from the research community. 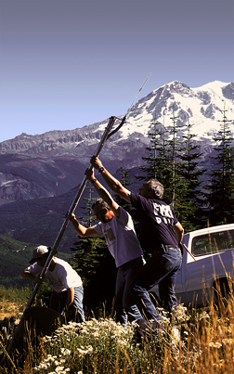 Ortings fire chief (right), a U.S. Geological Survey scientist (center) and a volunteer of the Pierce County, Washington, Explorer Search & Rescue Unit install an antenna for a telemetry repeater above the Puyallup River valley. The antenna is part of a lahar detection system that provides advance warning of large mudflows coming into the valleys surrounding Mount Rainier. Photo by Mark Reid, USGS. At that time, geologists were providing hazard information to local planners to help them implement the Growth Management Act, which limits development based on geological hazards. And USGS researchers, along with Mount Rainier National Park staff and a core group of local teachers, were actively working on an education program to spread the word about various volcanic risks, including lahars. Finally the hazard designation trickled down to the local level, says Orting resident Marianne Smith. Born and raised in Tacoma, Wash., she has always had a view of the mountain from her home. Now a second-grade teacher living and working in Orting, Smith is an active member of the Mount Rainier Volcano Hazard Work Group, a consortium of more than 20 local, state and federal agencies  including Pierce County Emergency Management, the Washington State Emergency Management Division and the National Park Service  that has met quarterly for the past 10 years. When she moved to Orting, Smith remembers taking geology into account when purchasing her home, but it wasnt volcanic risk she thought of. Rather, she checked to make sure the house was outside of the 100-year floodplain. Like many residents, Smith thought that she would have advance warning of any volcano-related events  the telltale steaming, venting and bulging that preludes an eruption. Once the community realized that lahars may not give sufficient advance warning for evacuation, people became quite alarmed, Driedger says, so they took action. First, the Mount Rainier work group wrote an emergency response plan for the volcano, which was accepted later by both the county and the federal government. They also encouraged the development of a lahar detection and warning system in the Puyallup and Carbon river valleys. Since 1989, volcanologists have used acoustic flow monitors to listen to the ground and detect the passage of lahars at several volcanoes around the world. The premise here being that when a volcano is restless or perhaps has already erupted, youre expecting lahars and you want to know when theyre passing, explains Andrew Lockhart, a geologist at CVO. For example, acoustic flow monitors detected a lahar at Redoubt Volcano in Alaska on April 6, 1990. The detection made it possible to track the flow in real time and calculate its velocity during the already heavily monitored volcanic event. And with the burgeoning valley population, Lockhart says, the risk multiplied. I dont think there really are any other areas with a similar risk  where there is a record of large dangerous lahars that could be unheralded that also have a population at great enough distance to make the detection of those lahars a useful hazard mitigation tool, he explains. Thus at the request of Pierce County and USGS, Lockhart and USGS colleague Tom Murray set out to create an automated lahar warning system, the first and only of its kind. Developing a system that would give time for evacuation without creating false alarms was challenging, Lockhart says. When youre doing something that results in the evacuation of a population, its a pretty serious prospect and requires a lot of thought and care in how you come to that decision, he says. The system, in place since 2000, consists of an array of sensors located in private timberland in two stream valleys about 25 kilometers from Orting. The sensors measure ground movement at specific frequencies; only events large enough to inundate Orting will trigger a warning. If the network detects a lahar, it will ring a bell and emit a bright flashing light at both the Pierce County 911 Center and the State of Washington Emergency Operations Center, only 15 miles apart. These two sites provide redundancy, Lockhart says, should something, such as an earthquake, incapacitate one of the locations. Calling down a predetermined list, the duty officers at each locale will notify emergency personnel of the threat. They will also activate a system of sirens in Orting as well as National Oceanic and Atmospheric Administration weather radios to broadcast an emergency message. Based on what the lahar velocities would be expected to be and distance of valleys, we can provide Orting with about 40 to 45 minutes of advanced notice, enough to make a useful attempt at evacuation, Lockhart says, stressing that they cannot predict the events; they can only provide warning. Although the system is yet untested by an actual lahar event, it has thus far triggered no false alarms. Additionally, Driedger says, the community has practiced evacuating through drill exercises, including siren tests. Generally, people have taken it seriously, Driedger says. Emergency managers have also simulated evacuation events. At a FEMA facility in Mt. Weather, Va., the first-line responders practiced their various roles in a simulated evacuation event  everything from writing press releases to answering calls from panicked residents. It was all so real, Driedger says. She was one of the emergency responders the morning of May 18, 1980, when Mount St. Helens erupted. Orting schools also run drills twice a year and have been doing so for 10 years, Marianne Smith says. Our students have this really in their bones. But, she says, the schools soon came to realize that these drills might not be enough. At a series of teacher workshops in 1995, run by Driedger and others, community members began discussing evacuation plans for the regions schools. During a lahar, the key is to get to higher ground, even only 50 feet up, to steer clear of the dangerous flow. The fastest way to get people out of the valley bottom, especially in Orting, is by foot, Pringle says. Most of the people who saved themselves during Mount Pinatubo debris flows in 1991, for example, did so by running to high ground. As the teachers discussed at the workshop, however, the Puyallup and Carbon rivers make such an evacuation impossible. When I described having high ground so close we could spit at it and the frustration of not being able to get to it, the idea was born of a bridge, Smith recalls. For years, her bridge idea was on the cutting room floor, but when the city of Orting began building the new intermediate school, Ptarmigan Ridge, in 2000, that all changed. Before then, the elementary and middle schools were on the same campus with the high school, so there were plenty of cars available for an evacuation, explains Kerbs, principal at Ptarmigan. With the new school, however, they realized that they did not have enough vehicles, and the buses would take too long to warm up in an emergency. Additionally, even with enough cars, trying to evacuate thousands of people from town, especially during rush hour, would further reduce their chances of survival. Fortunately, a dike road runs behind the school along the Carbon River and leads to a hillside about 3 kilometers away. All students would need is a bridge to cross over the river in order to get to the high ground. Kerbs himself ran the path to the river several times the summer the school was being built; it took him 16 minutes. He figured a 40-minute window might be just enough time to get everyone out. The turning point, Kerbs says, was at a PTA meeting where a couple of parents became energized about the bridge. The right people were there at the right time, Smith says: a grandfather who was retired Air Force, a retired Boeing project manager, a bookkeeping mom, the former Orting fire chief and work group member, and some just plain scared parents. This coalition of parents formed the Bridge for Kids project. Since the fall of 2001, the group has met every other Wednesday, trying to find ways to drum up support and funding for a bridge across the Carbon River. The bridge would provide routes for a by-foot evacuation of Ptarmigan as well as Ortings middle, high and primary schools (a total of 2,000 students and staff). Now a nonprofit organization with officers and board members, Bridge for Kids has requested money from the state, recently receiving $250,000 for a feasibility study. Next, they would like to gain congressional support in order to secure some federal funds. The project could cost close to $13 million. Although the valley communities surrounding Mount Rainier have come a long way since the days Rocky Crandell went into the field to reconstruct the past landscape, their work is far from over. But with increased funding and support for preventing terrorist activities, the Mount Rainier Volcano Hazard Work Group has been on the backburner, Pringle says. We are now dwelling on terrorism so much, both budgetarily and emotionally, that we have very little funding for natural hazards mitigation, even though the potential risk is great, he says. Funds have dried up at the state geologic survey for conducting research studies at Mount Rainier. Still, Pringle continues to dig up and date lahar-buried tree stumps in his spare time. He hopes that the work group will be reinvigorated soon, and that those who fund the states geologic hazards and public safety budgets will once again realize the great economic value of better understanding recent geologic history. Educational efforts for the lahar risk continue, however, Driedger says. At a workshop this summer, the work group will update educators and emergency responders on its progress with lahar-related activities. The group now has a lahar detection system and an evacuation plan for both the community and Mount Rainier National Park, as well as continued progress with Bridge for Kids, a new curriculum and teacher workshops. If our outreach effort has been successful, it has been because of grassroots public involvement and strong managerial and scientific support at all involved agencies, she says. Evacuation drills also continue. At Ptarmigan, the whole school can clear the building in 90 seconds. The motto is be prepared, not scared, Kerbs says. Indeed, Driedger and Pringle both say it is important that people not fear the mountain. We want to encourage people to understand geological processes at volcanoes and elsewhere so that they can respect them and understand what areas are affected, but also know that they can live comfortably nearby, says Pringle, who himself does not live in an area at risk. Geologists, Pringle notes, play a key role in helping average citizens, who may not have that visceral feeling for the scale of events, understand the risks. The view, however, that Kerbs most looks forward to is just out his office window. Now, he sees a hill; soon he hopes to see a bridge over the river to get there. On Nov. 13, 1985, nearly a year after Nevado del Ruiz in the Colombian Andes began showing signs of unrest, the volcano let loose. Overnight, more than 23,000 people died, 5,000 people were injured, and 5,000 homes were destroyed. Although it was one of the most deadly volcanic events in history, this volcano only erupted 3 percent of the magma erupted by Mount St. Helens in Oregon in 1980. What caused the high death toll were large hot mudflows called lahars racing off the volcano to the valley towns below. 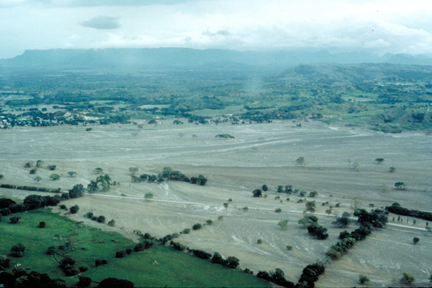 Within four hours of the eruption of Nevado del Ruiz in Columbia in November 1985, lahars had traveled 100 kilometers, killing more than 23,000 people, and leaving more than 5,000 homes destroyed along the Chinchiná, Gualí and Lagunillas rivers. In the town of Armero, three-quarters of its 28,700 inhabitants perished. Photo by J. Marso; courtesy of USGS. Despite its equatorial locale, 25 square kilometers of snow and ice covered the peak of the 5,389-meter-high volcano in 1985. The November eruption sent a series of very hot ash and rock flows surging across the peak, quickly melting and eroding 10 percent of the snow and ice. Within minutes, a hot mixture of water, ice, pumice and rock debris plummeted down the sides of the mountain into the six major river channels draining the volcano summit. Flowing down the volcano at an average of 60 kilometers per hour, these lahars grew in size as they stripped the hillsides of soil, loose rock and vegetation. Houses and towns that were located high enough above the river channels escaped damage. The city of Armero, however, was destroyed  for the third time in half a millennium. Located at the mouth of Rio Lagunillas, 74 kilometers from Ruiz, Armero was inundated with several pulses from the lahars. The largest pulse destroyed Armero and swept away or killed more than three-quarters of the towns 28,700 residents. Smaller pulses of hot mud continued to inundate the city over the next several hours. Fewer than four hours after the initial explosion atop Ruiz, the most catastrophic lahar in recent history had taken its toll. The site of Armero is now a memorial, with no plans of rebuilding the city again. Sadly, geoscientists suggest that Armeros residents could have survived had they walked only a few hundred meters to higher ground. And a warning network would have provided residents ample time to escape. Ultimately, the event helped lead to the creation of lahar warning systems, such as the one at Mount Rainier.